Engineers at NASA’s Kennedy Space Center are inventing robotic drones known as Extreme Access Flyers which are able to withstand the inhospitable conditions of space and “hunt and gather” samples from other worlds in places that are inaccessible to rovers. The machines are being built to work in spite of the thin atmosphere of Mars, or the airless voids of asteroids and the moon. By using a lander spacecraft as a base to replenish batteries and propellants between flights, scientists envision that Extreme Access Flyers will be able to travel to shaded regions of a hard-to-reach crater and pull out soil samples. Researchers have assembled several models to test aspects of the final machine. One model is a large quad-copter about five feet across with ducted fans. This is about the size of the prototype the team had in mind for a mission in space. Another ducted fan flyer, about the size of a human hand, has already been flown inside a 10-by-10-foot cube, and is being used to test software and control abilities. 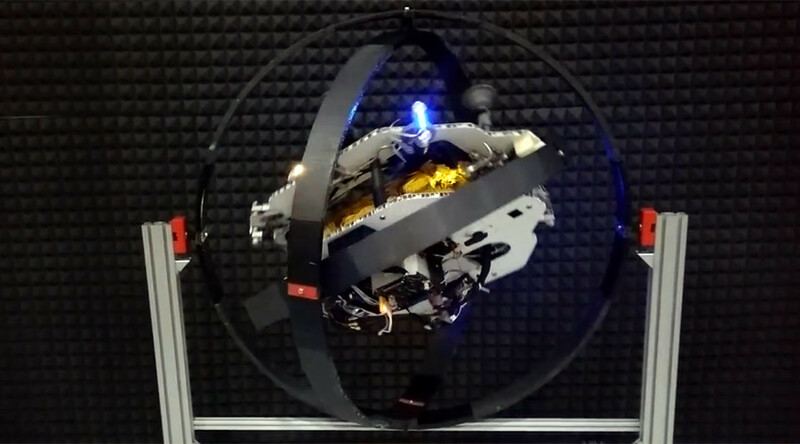 Yet another model is suspended inside a gyroscope that lets it maneuver as it would in zero gravity, using nitrogen pressure cold gas thrusters to tilt and spin. “This is a prospecting robot,” said Rob Mueller, the senior technologist for advanced projects at Swamp Works, the engineering group collaborating with NASA, in a statement. In the future, engineers said the machines could run on propellants made from resources found on distant worlds and be able to execute hundreds of explorative visits during a mission. The robotic drones are being designed to operate autonomously, with the team programming the flyer to recognize terrain and landmarks, and even “decide” the best places to take samples. Scientists say there is no GPS to help it navigate, and the communication delays are too large to permit for direct control from Earth. NASA researchers say the sampling vehicles could have applications on Earth, too. They could be used to pull soil samples in areas with heavy toxins, which could be useful for first responders, or at sites that might be at risk to humans, such as a radiated site. “We’re an innovations lab, so in everything we do, we try to come up with new solutions,” said Mueller.